It’s been a long, cold, lonely winter. Turning a corner in Singapore and in China. Initiate coverage on Shangri-La Asia (69 HK / SGX:S07). Hotel RevPARs are currently ~20% down from their peak in 2012, having been affected by stiff competition from new hotels despite climbing visitor arrivals. Going forward, given that much of last year’s supply injection was back-end loaded, we expect hotel RevPARs to accelerate from the pace seen in 1Q18. Visitor arrival growth has had a healthy start with visitor days growing +1.2% y-o-y in Jan, +7.1% in Feb, and +8.6% in Mar. On the other hand, hotel room supply is only expected to increase +2.5% in 2018, +0.8% in 2019, and +0.6% in 2020. Singapore is, however, not the only place where we see a demand-supply situation ripe for RevPAR growth. RevPAR growth in mainland China turned positive in 1Q17 after several years of decline, and we believe the recovery is still in its early stages, particularly for luxury hotels. From channel checks and data points, it appears that the growth of luxury hotel room supply in Tier 1 and 2 cities has been slowing down while the domestic tourist spend has continued its relentless pace of growth. which are discussed in greater detail in the sector report. Given the current demand-supply situation, we believe existing hotel owners/operators are poised to benefit from several years of RevPAR recovery. We initiate coverage on Shangri-La Asia [Rating: BUY; Fair Value: HK$21.05] (see report: Shangri-La Asia - Another Summit To Conquer), an Asia-based hotel ownership and management company, with a portfolio consisting mainly of five-star deluxe city centre hotels and resorts. With the group’s substantial exposure to mainland Chinese hospitality as well as a high degree of operational leverage, we see Shangri-La as a proxy to what we expect to be a multi-year recovery in the Chinese luxury hotel industry. On the other hand, for hospitality S-REITs, while we see 2018 as a positive year operationally, we remain wary on the impact of rate hikes on REITs as an asset class. Out of the hospitality S-REITs, we like Far East Hospitality Trust [Rating: BUY; Fair Value: S$0.735] as we believe that the operational upside has yet to be priced in. We are also positive on Hotel Properties Limited [Rating: BUY; Fair Value: S$4.74] given its attractive valuations. We have a POSITIVE view on the regional hospitality sector. RevPAR growth in mainland China turned positive in 1Q17 after several years of decline, and we believe the recovery is still in its early stages, particularly for luxury hotels. From channel checks and data points, it appears that the growth of luxury hotel room supply in Tier 1 and 2 cities has been slowing down while the domestic tourist spend has continued its relentless pace of growth. First, luxury spending is back, buoyed by the high-spending millennials. Revenue for 5-star hotels as a whole has been stagnant since 2012 when President Xi first launched an anti-corruption campaign against official trips and banquets. Then in 2017, luxury spending grew 20% y-o-y, along with a recovery in luxury hotel RevPARs. This time, millennials are a key driving force behind this resurgence in luxury spending – consumption which is largely legitimate and non-government in nature. Bain & Company expects the luxury goods and services industry in China (including luxury hospitality) to grow by 20-22% in 2018 (at constant exchange rates). Second, a backdrop of complementary government legislation with regard to the country’s mandatory paid leave system. Third, massive infrastructure projects which have provided the right environment for domestic tourism (and associated spending) to thrive. With the slow-down in the rate of growth of new hotels competing for market share, existing hotel operators now have the opportunity to grow occupancy and consequently boost Average Daily Rates (ADRs). Given that the hotel industry typically moves in multi-year cycles of RevPAR growth and decline, we believe that the recovery in Chinese luxury hospitality has just started. In the following segments, we discuss the sector’s demand-supply dynamics in greater depth. According to Smith Travel Research (as quoted in Bloomberg), which tracks largely multi-national hotel chains, RevPARs in China have made a recovery after several quarters of decline, clocking growth ranging from 1% to 7% y-o-y for the period from 4Q16 to 1Q17. We believe this early stage of the RevPAR recovery is largely due to the tightening in hotel supply, as it was preceded by an improvement in average occupancies starting early 2016, which was then followed by a growth ADRs in RMB terms from mid-2017 onwards. We believe that as occupancies continue to climb into the 70% range, hotels will see themselves as having passed an important threshold to start pursuing a rate-based strategy to improve yield. When talking about the Chinese hospitality market, our attention is mainly spent on domestic tourism, where arrival and revenue numbers continues to dwarf that of inbound tourists. In 1H17, there were 2,537m domestic tourists vs. 69.5m inbound tourists. In the same period, the US$60.1b (~RMB 650b) spent by inbound tourists was only 18% compared to RMB 2.17tn in domestic tourism revenues. From 2005 to 2016, domestic tourist arrivals in China have grown at a CAGR of 12.5%. In 1H17, this figure grew 14% y-o-y. We believe that domestic tourism spending, in particular, on luxury hospitality will be driven by a growing class of millennials with substantial spending power, complemented by supportive leave legislation and the development of massive infrastructure projects. From 2005 to 2016, the tourism expenditure of urban residents in China has expanded 9-fold RMB 3.2t, with a CAGR of 122%. In 1H17, this tourism increased 16% y-o-y, and we believe this explosive growth has been driven by the continued ballooning of the middle-class. This growth is expected to continue going forward. We define the middle and upper classes as having US$15k in income annually. Euromonitor forecasts that the percentage of households falling within these economic segments will increase from 34% in 2016 to 47% in 2021F. Furthermore, the recent resurgence in luxury spending led by millennials – which we deem to be largely legitimate and thus unlikely to be affected by the anti-corruption campaign – should also have spill-over effects for hospitality as more people “trade up” their holiday accommodations. Bain & Company expects the luxury goods and services industry in China (including luxury hospitality) to grow by 20-22% in 2018 (at constant exchange rates), after it grew 20% in 2017. We see Shangri-La as a clear beneficiary to the expanding middle-class and the evolving consumption habits of millennials in China. On 1 Jan 2008, China’s State Council issued the Regulation on Paid Annual Leave for Employees. According to the regulation, employees who have worked continuously for one year or more are entitled to paid annual leave, with the number of days of annual leave to be determined by the employee’s accumulative working time. In addition, companies are to compensate employees 300% the daily wage for each unused day of leave. And in the later part of 2008, implementation measures for paid annual leave came into force. Despite this regulation, implementation was far from air-tight. According to the 2016 White-Collar Worker Satisfaction Index Report of leading career platform, Zhaopin, almost 40% of employees had not taken vacations over the past year. One possible reason is that the calculation of wages is closely linked to monthly quotas which may be very difficult to achieve once leave is taken. The government has taken steps to remedy the situation. As of 1 Jan 2017, “Measures for the Public Announcement of Major Labour Security Violations” took effect and called for corporate offenders of China’s labour protections to be “named and shamed” on the Ministry of Human Resources and Social Security (MHRSS) website as well as mass media such as newspapers and TV channels. Meanwhile, China’s number of mandated annual leave remains low relative to other countries worldwide. As China moves towards implementing their annual leave system and possibly increasing the amount of annual leave, we believe that these measures will give domestic tourism a shot in the arm. Lastly, supporting this increase in wealth and the tourism-friendly legislation are a string of massive land infrastructure projects as well as continued growth in the aviation space. Major road and highway projects include the Hong Kong-Zhuhai-Macau Bridge (among the longest fixed-links in the world and set to open to traffic on 1 Jul 2018) and the expansion of the high-speed railway network to 30k km by 2020 and 38k km by 2025. From 2007 to 2017, the number of airports in use in China has increased 54% from 148 to 228 airports. In the same time, the number of people flown on domestic routes has nearly tripled from 168.4m to 495.8m, growing at a CAGR of 11%. We believe that as transportation infrastructure continues improve in China, the development will have a more-than-proportional boost on the number of people travelling for leisure and on the frequency of those trips. The growth rate of the number of five-star hotel rooms in China has slowed considerably since 2012, a development which bodes well for owners as well as operators of existing hospitality assets. Furthermore, in terms of aggregate hotel revenue, we see 5-star hotels as being more resilient to home-sharing competition such as Tujia and Airbnb. From 2012 to 2016, hotel revenue across all tiers dropped 16.6%, while that of 5-star hotels only dipped 0.1%. Revenues for 5-star hotels have been stagnant in 2012 when President Xi first launched an anti-corruption campaign against official trips and banquets. Coupled with the growth in the number of hotels during that period, RevPAR growth rates during that period were generally negative before recovering in 2017. 1Q18 Hotel RevPAR growth was positive for all the REITs under our coverage, ranging from +0.8% for CDL Hospitality Trusts’ (CDLHT) SG portfolio to +6.9% for OUE Hospitality Trust’s (OUEHT) Mandarin Orchard Singapore. However, 1Q18 Serviced Residences RevPAU growth was more a mixed bag. RevPAUs dropped 7% y-o-y for Ascott Residence Trust’s (ART) SG-based SR portfolios but increased +7.6% y-o-y for Far East Hospitality Trust (FEHT), which is unsurprising given its low base in 1Q17. Hotel RevPARs are currently down ~20% from their peak in 2012, having been affected by stiff competition from new hotels despite climbing visitor arrivals. Going forward, given that much of last year’s supply injection was back-end loaded, we expect hotel RevPARs to accelerate from the pace seen in 1Q18. According to channel checks, corporate demand for long term stays appear muted. Some possible reasons include tightened rules on hiring foreigners, and the reduction in minimum rental period for private homes from 6 months to 3 months. We are not too worried about the URA proposal to allow short-term rental of condominium apartments on platforms like Airbnb, as we see the 80% consent rule as being a generally high threshold to cross. 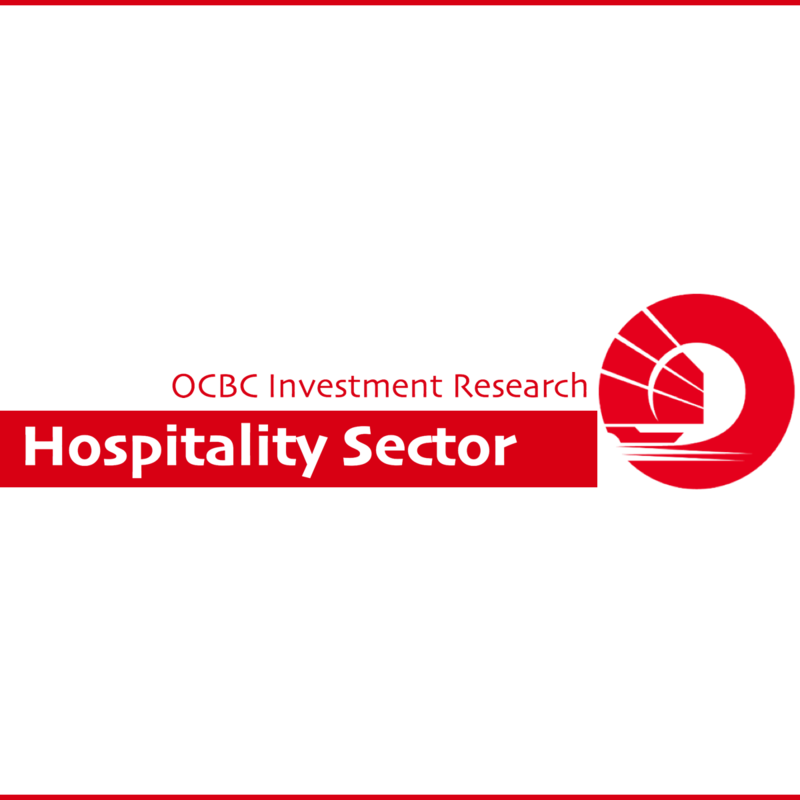 We believe the operational upside is largely priced in for most of the hospitality REITs, except Far East Hospitality Trust [Rating: BUY; Fair Value: S$0.735] which remains our top pick within this sub-sector. While OUEHT posted a particularly strong RevPAR growth in 1Q18, they will face a higher hurdle in the latter half of the year given their high base in 2H17. We continue to like Hotel Properties Limited [Rating: BUY; Fair Value: S$4.74], which we see as a neglected proxy to a stronger hospitality market worldwide.